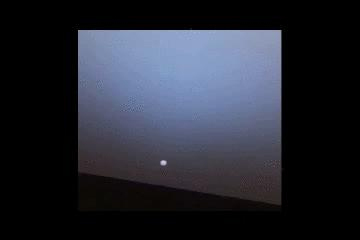 Sunset on Mars, imaged by Opportunity. Dust gradually obscures the Sun during a blue-sky martian sunset seen in a sequence of newly processed frames from NASA's Mars Exploration Rover Opportunity. "It's inspirational and beautiful, but there's good science in there, too," said Dr. Jim Bell of Cornell University, Ithaca, N.Y., lead scientist for the panoramic cameras on Opportunity and its twin, Spirit. The amount of dust indicated by Opportunity's observations of the Sun is about twice as much as NASA's Mars Pathfinder lander saw in 1997 from another site on Mars. The sunset clip uses several of the more than 11,000 raw images that have been received so far from the 18 cameras on the two Mars Exploration Rovers and publicly posted at http://marsrovers.jpl.nasa.gov . During a briefing today at NASA's Jet Propulsion Laboratory, Pasadena, Calif., Bell showed some pictures that combine information from multiple raw frames. A patch of ground about half the area of a coffee table, imaged with the range of filters available on Opportunity's panoramic camera, has soil particles with a wide assortment of hues -- "more spectral color diversity than we've seen in almost any other data set on Mars," Bell said. Opportunity is partway through several days of detailed observations and composition measurements at a portion of the rock outcrop in the crater where it landed last month. It used its rock abrasion tool this week for the first time, exposing a fresh rock surface for examination. That surface will be studied with its alpha particle X-ray spectrometer for identifying chemical elements and with its Mössbauer spectrometer for identifying iron-bearing minerals. With that rock-grinding session, all the tools have now been used on both rovers. Dr. Ray Arvidson of Washington University, St. Louis, deputy principal investigator for the rovers' science work, predicted that in two weeks or so, Opportunity will finish observations in its landing-site crater and be ready to move out to the surrounding flatland. At about that same time, Spirit may reach the rim of a larger crater nicknamed "Bonneville" and send back pictures of what's inside. "We'll both be at the rims of craters," he said of the two rovers' science teams, "one thinking about going in and the other thinking about going out onto the plain." Not counting occasional backup moves, Spirit has driven 171 meters (561 feet) from its lander. It has about half that distance still to go before reaching the crater rim. The terrain ahead looks different than what's behind, however. "It's rockier, but we're after rocks," Arvidson said. Spirit can traverse the rockier type of ground in front of it, said Spirit Mission Manager Jennifer Harris of JPL. As it approached the edge of a small depression in the ground earlier this week, the rover identified the slope as a potential hazard, and "did the right thing" by stopping and seeking an alternate route, she said. However, engineers are also planning to transmit new software to both rovers in a few weeks to improve onboard navigation capabilities. "We want to be more robust for the terrain we're seeing," Trosper said. The software revisions will also allow engineers to turn off a heater in Opportunity's arm, which has been wasting some power by going on during cold hours even when not needed. As it heads toward "Bonneville" to look for older rocks from beneath the region's current surface layer, Spirit is stopping frequently to examine soil and rocks along the way. Observations with its microscope at one wavy patch of windblown soil allowed scientists to study how martian winds affect the landscape. Coarser grains are concentrated on the crests, with finer grains more dominant in the troughs, a characteristic of "ripples" rather than of dunes, which are shaped by stronger winds. "This gives us a better understanding of the current erosion process due to winds on Mars," said Shane Thompson, a science team collaborator from Arizona State University, Tempe. The rovers' main task is to explore their landing sites for evidence in the rocks and soil about whether the sites' past environments were ever watery and possibly suitable for sustaining life. JPL, a division of the California Institute of Technology in Pasadena, manages the Mars Exploration Rover project for NASA's Office of Space Science, Washington, D.C. Images and additional information about the project are available from JPL at http://marsrovers.jpl.nasa.gov and from Cornell University at http://athena.cornell.edu .